Update: the times reported by the Bench utility are CPU times, i.e. they represent the time spent working by your various CPUs. The “real/wall” time, i.e. the time you effectively have to wait as a user, is usually a third less than that. So the “real” time for my blog went roughly from 7 seconds to 5 seconds. In a previous blog post about PieCrust performance, I mentioned how static site generators are dependent on the performance of their formatting and templating libraries. One of the most common formatters are Markdown formatters and, by default, PieCrust uses Python Markdown. It’s the easiest one to install and use, but it’s far from the fastest one. 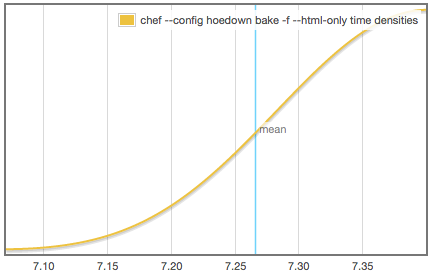 As far as I know, the fastest one that’s still maintained is Hoedown, for which some Python bindings exist. And if you have a recent enough version of PieCrust, there will be support for a Hoedown formatter, as long as you install Hoedown. You can do that by running pip install hoedown. Pretty worth it if you ask me! 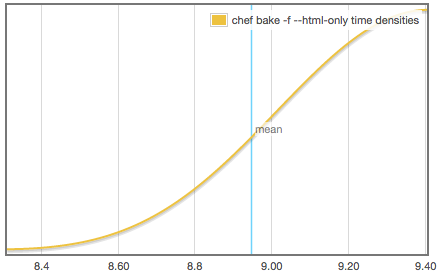 Now most of the time spent baking happens during templating with Jinja2… time to look for a faster alternative?